It was the way my hands smelled all day after mixing the orange zest and sugar together. 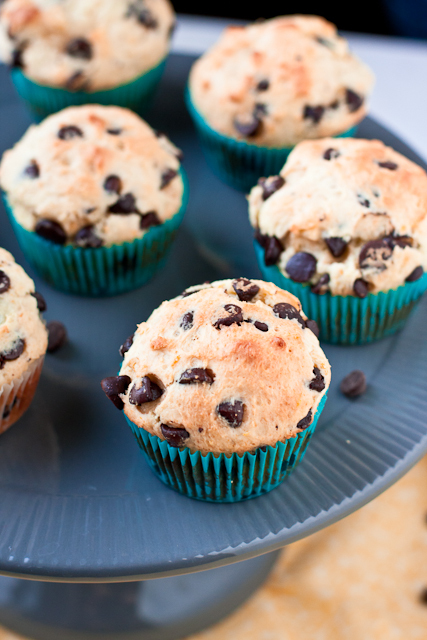 It was the way the baking muffins made my house smell bright and citrusy. It was the smack-you-in-the-face whiff of orange each time I lifted the cake dome to snag another muffin. 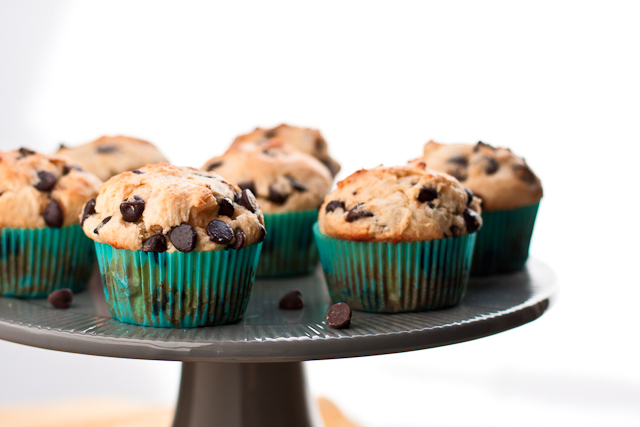 And after all the talk about how fabulous those muffins smell… they taste pretty amazing, too. 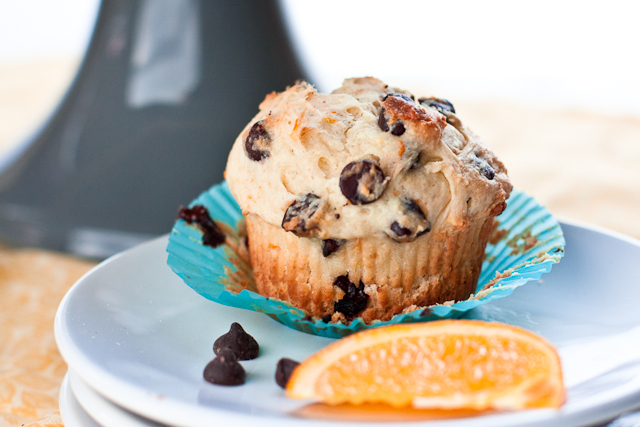 There’s plenty of orange flavor throughout this big, fluffy muffin. 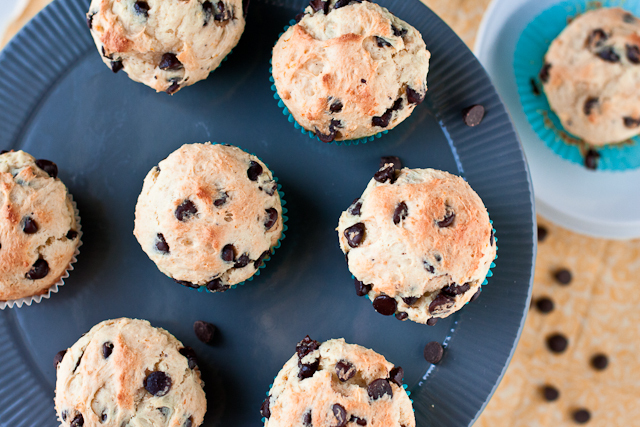 I mean, really – if there’s one place that a big muffin top belongs, it’s on an actual muffin. 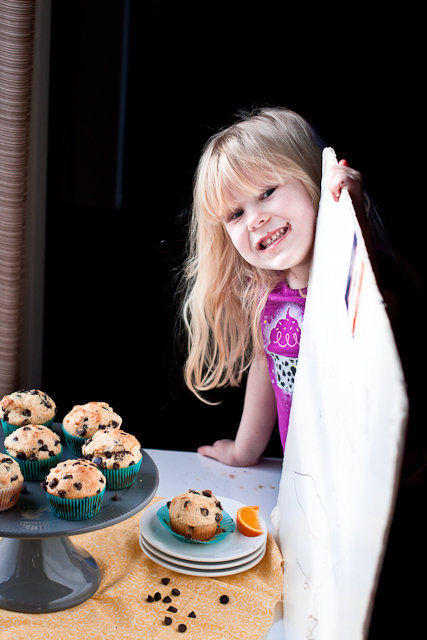 And I’ll give you one guess as to what her favorite part of the muffins were. She’s only here for the chocolate chips. 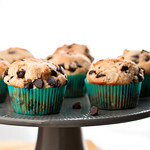 Tender orange-scented muffins studded with dark chocolate chips. Using your fingers or the back of a spoon, work the sugar and orange zest together for 1-2 minutes until very fragrant. Cream butter and orange sugar on medium-high speed until light and fluffy, about 3 minutes. Add chocolate chips to the mixer, mixing for just a few more seconds to distribute evenly (the batter will be very, very thick). Divide the batter evenly among cups, using a large cookie scoop (my scoop is ~2.25 inches across). Bake for 8 minutes and then decrease oven temperature to 375 and bake for ~10-12 more minutes until golden brown and a skewer inserted in the center comes out clean. I really love the combination of chocolate and orange. Simply perfect! I seriously need a burst of citrus to get me through this crazy winter cold. A little smell of sunshine would go a long way! What an adorable picture of your little assistant! These look fantastic! And your little helper is so cute! Mmm … I can smell that orange! I bet the tanginess from the Greek yoghurt goes really well, too! Your batter will be thinner but you can use milk.